Take Advantage of Our Ultimate Lens Offer! 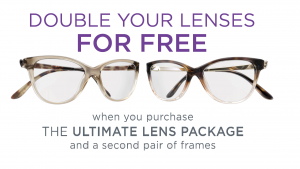 For a limited time, you can purchase the Ultimate Lens Package and get a second pair of qualifying lenses on us with the purchase of a second pair of frames. *The Essilor Ultimate Lens Package offers a single lens that brings together three innovative technologies from Varilux®, Crizal®, Eyezen™+, and Transitions®. Some restrictions apply. Please see store for details.